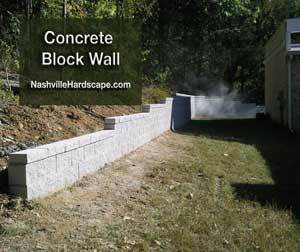 For all of your Concrete Block Retaining Wall Needs! When you want a Concrete Block wall in your landscape for your home contact us for pricing. This look can be achieved by using actual Concrete Block that has a surface like stone and is a man made product. For all of your Retaining Block wall Needs! 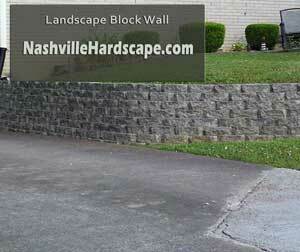 This wall is affordable and fits well in almost any landscape. This Concrete Block is called landscape block. When you need to hold back the hill this is the most affordable option. Give your property more flat space. When nature is encroaching a little to much and space is what you need give us a call. Visit our Segmented Wall Page! For all of your Landscape Block Retaining Wall Needs! This is a wall made of Landscape Retaining Wall block. Interlocking blocks leaning toward the hill help this wall stay together. Nashville Area. For all of your Cinderblock type Block Retaining Wall Needs! This wall leads from a side yard to a back yard area. Tennessee has rolling hills and to make a flat space sometimes a wall is needed. 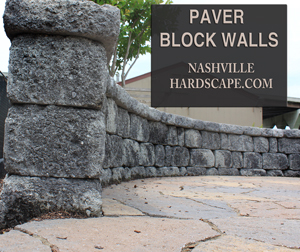 For all of your Paver Block Retaining Wall Needs! This wall is great as a sitting bench or just a decorative stone looking wall. Walls in Nashville are sometimes decorative and have a seating purpose. Call us today for your paver block wall. 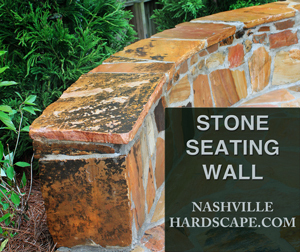 For all of your Stone Seating Wall Needs! This wall is great as a stone bench around a firepit or just for seating anywhere. This is a wall that we call a bench. Call us today for your stone seating wall. Does your Wall need Repair? Many professional landscapers, as well as homeowners, are finding many new uses for landscaping blocks, such as retaining walls for flowerbeds or for terracing a hilly terrain. They are available in several sizes, colors and styles that finding one to fit into your landscape should not be a problem. Landscape Block is more affordable than Natural Stone. Most of the landscaping blocks available today are designed for outdoor use, although some can, and are, used for interior finishes. For the same of this information, we'll talk about outdoor uses. A retaining wall, with proper engineering and design can provide a wall of landscaping blocks up to 50 feet high. Get your wall designed by a landscape designer. A wall such as this may be used on a hilly landscape where protection of dirt from erosion may be needed. The upper part of the terrace may be used for living space or a flowerbed. While several varieties of landscaping blocks are available, the one-sided block is best when used as simply a facing. This means that one side will be part of a hill or other material that it fronts. There are two-sided landscaping blocks available that are used when both sides of them will be seen, such as a single bull-nose block. This as a rounded end on both sides and may be used to circle a flowerbed with mulch or as part of a driveway lining. Different heights, widths and lengths of block are available to make every project using landscaping blocks fairly easy to complete. However, it is important to plan the project in detail before beginning. This also ensures you have all materials needed available when you start the project so you don't have to run out for more to complete it. Using landscaping blocks in two different heights can give the appearance of steps, especially aesthetically pleasing around a slightly raised pond or flowerbed. They can also be used to surround a swimming pool or hot tub. Depending on the size of the block, what it is being used for and how high they are stacked, mortar may be required for added stability. Blocks stacked one or two high probably don't need any form of bonding, but any higher will need to be cemented together. Whether the landscaping blocks you choose are round, square, oblong or just about any other shape imaginable, the selection of earth tone color and durability can provide a handsome decorative landscape, which will last for many years. For more information on landscaping blocks from the author visit Landscaping Basics or Landscaping Basics Blog. 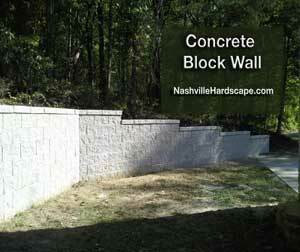 We are Concrete Block Wall Builders in the Nashville Tn area. 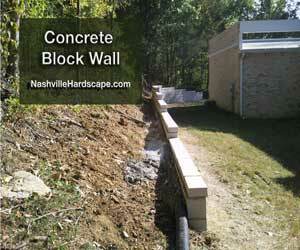 We provide Concrete Block Wall services to the Nashville Metro area and surrounding counties. We service Green Hills Tennessee, Tennessee, Murfreesboro, Smyrna, Brentwood, Franklin, Hermitage, Leipers Fork, Thompsons Station, Belle Meade, Green Hills, Kingston Springs, Brent Meade, Oak Hills, Almaville, Fairview, Forest Hills, Nolansville, Mount Juliet, and these counties: Williamson County, Davidson County, Maurey County, Rutherford County, Wilson County, Dickson County, Hickman County, and Marshall County Tennessee. 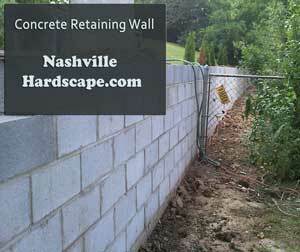 West Nashville, East Nashville, North Nashville, South Nashville, North, South, East, West, Nashville area, Concrete Block Wall Builder, Nashville Concrete Block Wall Installation, Backyard Concrete Block Wall. Lets make your Concrete Block veneer. Ace Hardware Concrete Block Wall DIY .